They say if you want to relive a moment, freeze it in a frame. I believe photos have the power to hit the rewind button. They have the power to take us back in time to moments we had buried deep in our hearts. 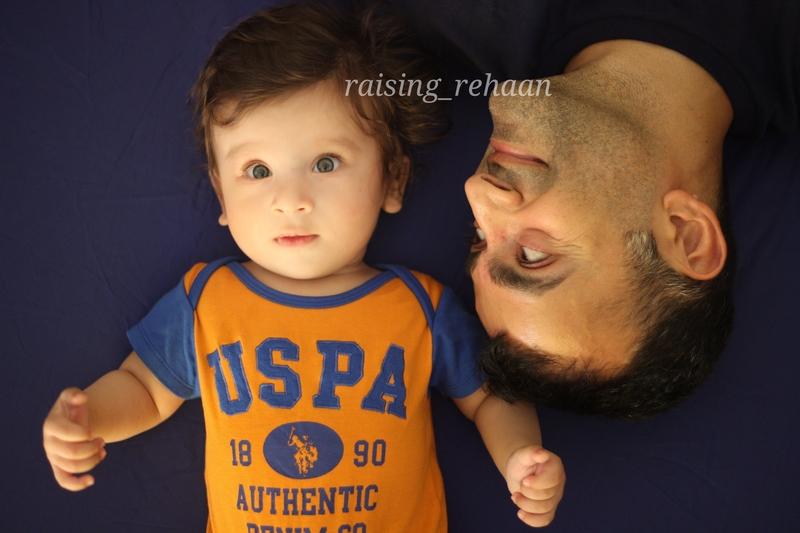 One such collection I love revisiting is Rehaan’s first baby photo shoot when he was 5 months old. Every time I go through these photos, my eyes well up. It doesn’t feel like an eternity has passed. But of course, it has, over a year has passed since then. A year of diapers and drools, melodrama and magic, tensions and tantrums, smiles and laughter, hugs and kisses, baby breath and baby babble, motherhood and madness. These photographs are the passage to the most beautiful phase of my life. Your child’s first photo shoot is both an unforgettable and exciting event. And as any event, some amount of preparation goes into this day as well. 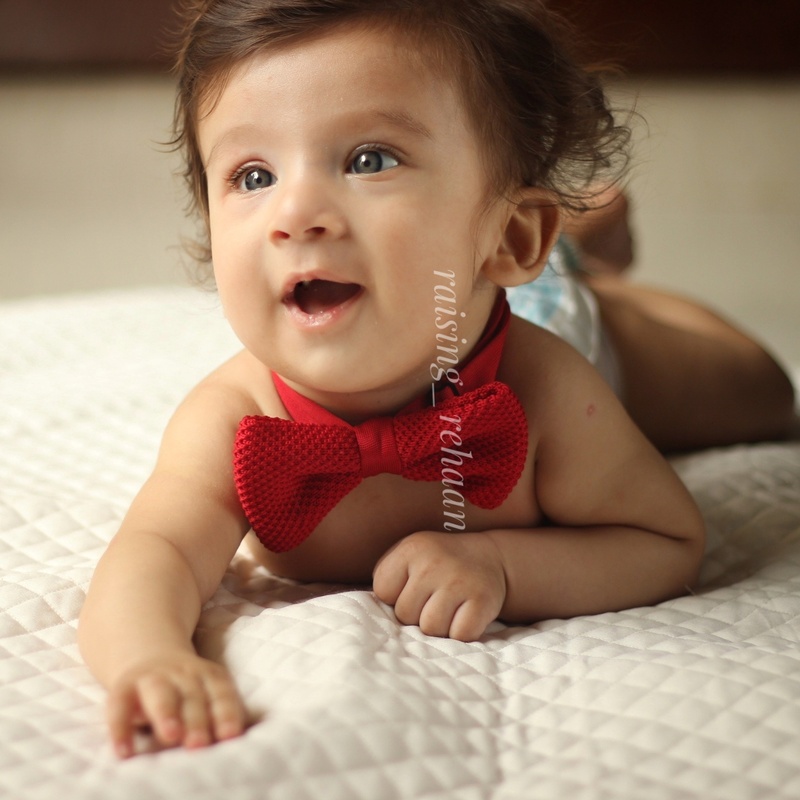 Sharing with you a few points that can help make a photoshoot with your baby a smooth sailing. Time: Plan the shoot around your baby’s schedule. Choose a time when your baby is the most active and happy. Avoid nap times. There’s no fun capturing a cranky baby. Location: Pick a location that you know your baby will be comfortable at. Keep the current weather conditions in mind. Outfits: Pick outfits that your baby will feel comfortable in. Fancy clothes are for fancy shows! Accessories & Props: Discuss and finalize a theme (if you wish to) so you have enough time to arrange for props and accessories. A favorite toy, blanket, heirloom, keepsake, etc. 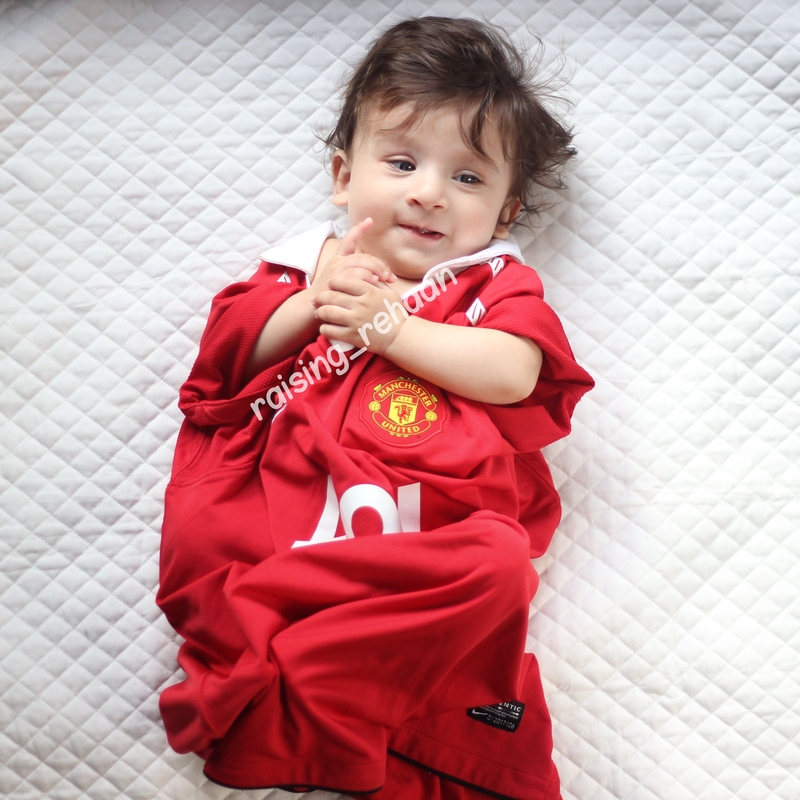 Rehaan’s papa is a football fan so the shoot couldn’t be complete without a ManUnited Jersey! Own Outfits: Don’t forget about yourself! These are memories that will last you a lifetime. Pick outfits that make you feel good about yourself. Also, keep in mind that you will be cuddling and holding the baby so nothing too harsh for your baby’s skin. Feed the baby right before the shoot. A content baby will be a lot more cooperative. Be prepared for worst case scenarios. Baby falling asleep, poop explosions, uncooperative baby, etc. Some days are just not meant for shoots. Keep your options open. ENJOY! Natural smiles make for great photos. 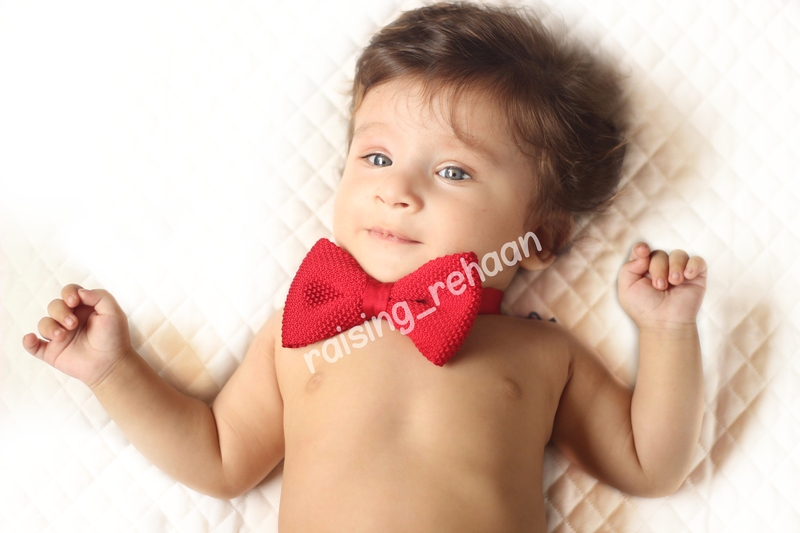 We were fortunate to have our first shoot for Rehaan by Adams Production. Thanks to Omar Bhatt for capturing us so well. Omar is a passionate photographer who captures moments with your precious ones and turns them into memories for life. The best part about working with him was the ease with which he handled my baby. Doesn’t come as a surprise as he himself is an uncle to three darling toddlers. The shoot happened in the comfort of our home and Omar had prepped us well enough to know what to expect and how we could get the best out of this shoot. At no point in time was Rehaan uncomfortable or cranky. He seemed to have thoroughly enjoyed his 15 minutes (plus a few hours) of fame! 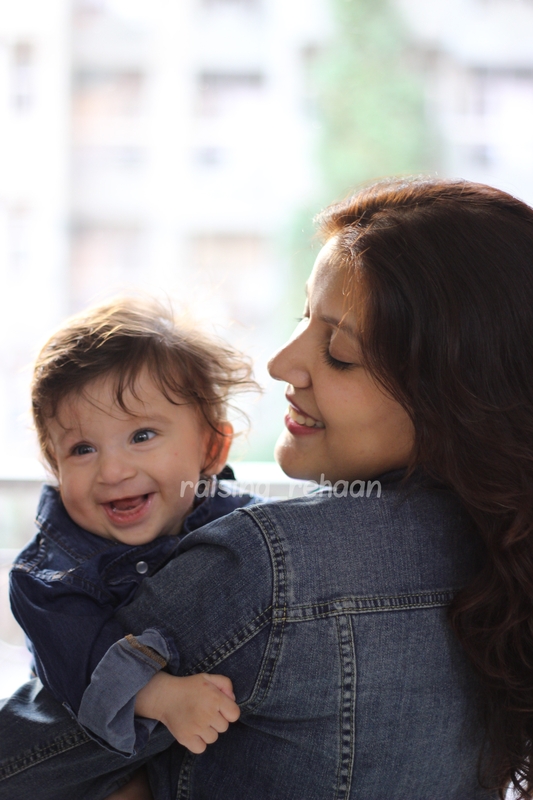 Can’t wait for Rehaan to turn two for his next shoot with him!